An impressive collection of items related to Dr. Martin Luther King Jr. will go up for auction in Falls Church on Thursday, just ahead of the 50th anniversary of the Civil Rights marches in Selma, Alabama. WASHINGTON — The auction has closed and the 16 items sold for a total of $99,668. The LBJ condolence letter to Coretta Scott King sold for $60,000, twice the price of the highest auction sale of a President Johnson signature. WASHINGTON — An impressive collection of items related to Dr. Martin Luther King Jr. will go up for auction in Falls Church, Virginia on Thursday, March 12. The items are owned by Stoney and Shirley Cooks, of Hyattsville, Maryland, who were both involved in the civil rights movement. Stoney was a college student in Indiana when he became part of a delegation of students who decided to travel to Selma for the march, whose 50th anniversary was celebrated last weekend. “Two days after Bloody Sunday, Stoney Cooks with three white people were driving through Alabama, just like we were free and cavalier. I say it was the dumbest thing I’ve ever done, you know — a black guy, riding south, heading to Selma, oblivious to all that was going on,” Stoney told WTOP. Stoney thought he would be in the South for a week, but he never returned to college. He wound up working with King as a staffer at the Southern Christian Leadership Conference. “SCLC was a movement. There was no librarian, no one trying to get a copy of everything for SCLC’s history,” he said. So he began collecting things, including handwritten notes of King’s that are about to be sold. The item the Cooks are selling that is getting the most attention is a letter many would probably assume is on display in a museum. 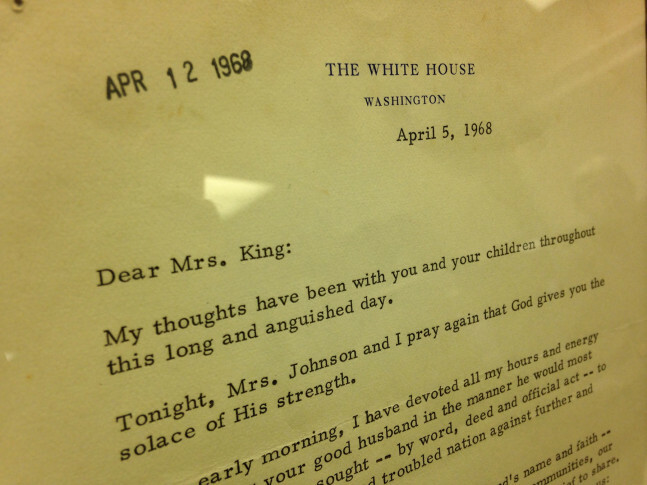 It’s the letter President Lyndon Johnson sent Coretta Scott King after her husband was assassinated. Written April 5, 1968, on White House stationery, it includes this pledge: “We will overcome this calamity and continue the work of justice and love that is Martin Luther King’s legacy and trust to us.” The letter was given to Shirley Cooks by her brother, singer and activist Harry Belafonte. The auction, by Quinn’s Auction Galleries in Falls Church, had been scheduled to begin at 6 p.m. Thursday, March 5, but because of the snow, it has been moved to 6 p.m. Thursday, March 12. Among other items to be sold is a guest book from King’s wake at Spelman College. Quinn estimates its value at between $4,000 and $6,000.